As we head into Spring, Carigiet Cowen have been very active across all sectors in the commercial property market throughout West Cumbria and the Lakes. At Hensingham Business Park, Whitehaven, the sale of Unit 3, a 3,000 sq ft new build office building completed in February, adding SE Ceilings Ltd to this growing business location. All external works on the estate have now been completed leaving four units ranging from 689 – 4,640 sq ft available To Let/ For Sale. Opportunities exist for businesses to agree specific fit out requirements with the developer in advance of taking occupation. In Workington, a number of suites ranging from 100 – 1,000 sq ft have recently come back to the market at Moss Bay House and Windermere House at Derwent Howe. The offices suites are available on easy in – easy out terms ideal for small or new start businesses. Agency Surveyors, Mike Beales and Ben Blain, are pleased to report a number of sales in the retail market to investors and owner occupiers, which include 71 Senhouse Street in Maryport and 29 Vulcans Lane in Workington. This together with the soon to complete investment sale of 32 King Street/ 34-36 Lowther Street in Whitehaven let to Costa, is showing that despite gloomy news about the nation’s retail sector, deals are still being achieved. Turning to new opportunities, Ben is delighted to bring to the market 15-17 Station Street in Keswick, formerly occupied by Cohen’s Chemist. In Workington, No’s. 29 and 50 Finkle Street offer space suitable for a variety of retail, showroom or food related uses. For the investment market, 53 King Street let to Ramsdens is available for sale, offering a gross initial yield of 7.74% with guaranteed future uplift on rent. In the industrial sector, the sale of the former commercial vehicle testing station at Lillyhall Industrial Estate is due to complete shortly. New opportunities include Units 3 and 4 Ullswater Court at Derwent Howe which offer around 1,000 sq ft of workshop/ storage space, ideal for start up businesses. Other opportunities are expected to be brought to the market in the coming weeks and months, so keep an eye out for further details. 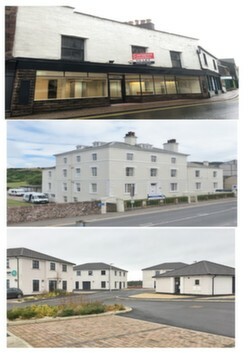 Finally, a number of potential development/ conversion opportunities are currently available through Carigiet Cowen. The Old Customs House in Whitehaven is a three storey Grade II listed building with direct frontage to Whitehaven Harbour, currently used as offices, the property offers potential for conversion to mixed commercial and residential use. Across the town, the former Magistrates Court building offers some 15,800 sq ft of ground and first floor space which has the potential to provide high quality office space or conversion to residential, subject to planning. It has the added benefit of private town centre parking. Further down the coast, Grindal House in St Bees is a substantial, attractive period building which could convert to hotel/ guest house or residential apartments subject to planning. Mike Beales at Carigiet Cowen commented “it is encouraging to see that, despite the cloud of uncertainty hanging over the country as we fast approach the UK’s deadline to leave the EU, activity across all sectors in Cumbria’s commercial property market has continued at a steady pace. With new instructions coming through, Carigiet Cowen have space to suit a wide variety business needs”.